The El Niño event currently underway in the Pacific Ocean is proving to be one of the strongest in the past 65 years. It has peaked, with forecasts now suggesting a steady decrease in temperatures throughout the remainder of the winter and spring. What impact, if any, will this historic El Niño episode have on this year’s growing season? El Niño and La Niña are the warm and cold phases of the El Niño / Southern Oscillation (ENSO), a linked ocean-atmosphere phenomenon that occurs along the Equator in the Pacific Ocean. Typically, water in the western tropical Pacific is very warm (mid-80’s ℉), while the water in the eastern Pacific, along the west coast of South America, is much cooler (low-70’s ℉). An El Niño occurs when the warm western water expands in area and spreads eastward along the equator. The warm water often arrives along the South American coast around Christmas, thus the name El Niño, or Christ Child. This sloshing of warm water back and forth along the equator occurs every 3-7 years – swinging between El Niño, Neutral, or La Niña (when the warm water retreats and shrinks toward the western tropical Pacific). Strong, long-lived thunderstorms tend to form over the warmest tropical waters. As the warm water expands eastward during an El Niño, these strong thunderstorms shift eastward as well. During an El Niño, there is an unusually strong subtropical Pacific jet stream that directs storms and large amounts of moisture to Southern California instead of to the Pacific Northwest. It is this linkage of warm water, thunderstorms, and the Pacific jet stream that results in far-reaching impacts on North American weather. How Will El Niño Look This Year? In Figure 1, you can see how the observations so far (black) compare with the very strong El Niño winters of 1982-1983 (red) and 1997-1998 (blue). We also show a variety of forecasts for the strength of the El Niño for the remainder of this winter and the coming spring in order to give a sense of the uncertainty of the forecasts. The consensus among forecasters is that the El Niño event has peaked, that it is among the top three events in the past 65 years, and that it will steadily decrease throughout this year’s growing season. Interestingly, a few forecasts predict that La Nina conditions will develop in late 2016. Figure 1. 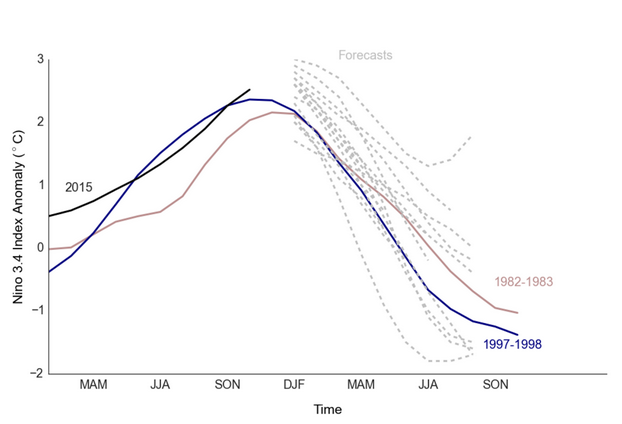 Current forecasts from 17 physical models (collected by Columbia University IRI) for the 2015-2016 Niño 3.4 index track those of the very strong El Niño events in 1982-1983 and 1997-1998. Although ENSO dominates other weather patterns in terms of global, annual-average impacts, its regional impacts vary from season-to-season and event-to-event. El Niño competes with other factors that influence weather, for example, prior soil moisture or large-scale teleconnections, which results in no two El Niño events looking exactly alike. In Figure 2, we show how much wetter or drier than average different parts of the Midwest were during spring following previous El Niño events. There is no consistent pattern to the spring rainfall in those years, meaning that the upcoming El Niño does not, on its own, shift the odds for a wet or dry spring in the Midwest. Figure 2. Maps of differences (green, wet; brown, dry) from average precipitation over US climate divisions for the March-April-May (MAM) season following the 6 largest (> 1.5 deg C) El Niño events since 1950. In the upcoming weeks, we’ll write about the relationship between El Niño and crop yields in the U.S. Corn Belt. We will share these results in upcoming blog posts. About the authors: Our Climatology team is a group of atmospheric scientists and statisticians who construct agronomically-relevant weather datasets. This data plays an important role in the development of our weather-dependent agronomic models, for example Nitrogen Advisor.